This is inspired by @paulwaldo’s post and is a slightly extended version of my mini macro. Edit [2016-03-07]: Uploaded a new version (mainly corrections in the help text) and added a png of the macro here. Do you use Hazel? What is your file management workflow? How big is my Trash? Already did! Was just looking over the help section, looking great! Really nice showcase of what KM can do, @Tom! I tried to get the filters to work, but had no luck. For example, I chose Files Bigger Than 100G and got a full list of my only 16GB trash. I also tried Last Time Stamp of 1s and still got the full list. Am I misunderstanding? Just out of curiosity, why the repeat of 12? If you enter 1s it is correct that you get the whole trash content listed. (Probably every file in the Trash will have an access date older than 1 second.) The conditions are explained in the help text. Is the entry field clean? You must only enter the value and the unit symbol like in the screenshot above, optionally a ‘+’ or ‘-’ prefix. In fact, a value without prefix counts as ‘+’ (bigger than or older than), any other char before the value counts as ‘-’ (smaller/younger). Maybe you have a space character or something in front of the “100G”? [Edit:] Nope, this isn’t true. A space character would be OK, and any other character other than +/- will raise an error. So this can’t be the reason. 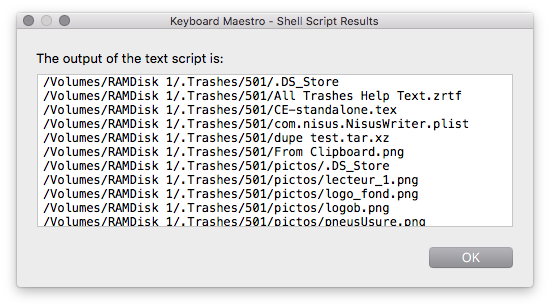 If not, are you sure that the listed items are not only a lot of .DS_Store files and empty folders? These are always deleted if you enter any condition (see the last section in the help text). No, the reason is that I somehow just felt better with a lower number than with 999. If you never want the user prompt to reappear after the first run, just set it to 1. Let me know if you get it to work. Nothing near the size of 100 GB there! So, what you are seeing is the expected behavior. 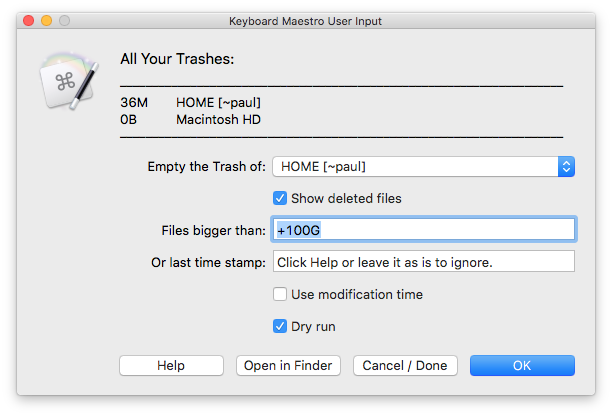 If you choose a timestamp or a size filter the macro will always delete .DS_Store files and empty items. 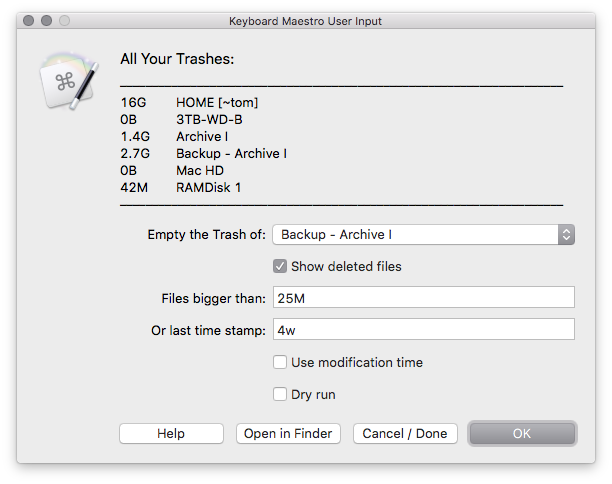 Otherwise —when you repeatedly empty the Trash with these filters— you would end up with a Trash full of .DS_Store and empty folders, because usually they’ll never pass the filters: For the typical size filter they are too small and the access time stamp of folders gets updated every time you run the macro. But it’s largely useless to have thousands of .DS_Store files and empty folders in the Trash, that’s why I delete them, even when a size/age condition is set. Try it with more sensitive filters, like 2d and/or 5M, for example. There is an alignment glitch in the tabulated display of the disks/trashes, depending on the amount of figures in the displayed values. This is a cosmetic glitch only. I will fix it when I find the time.